Low-Speed 80 RPMs and 10-year warranty. Turn nuts to nut butter, extrude pasta, grind coffee and spices, mince herbs, make baby food, and whip up soy milk and wheatgrass in a flash. No clogging, foaming or heat build up. Dual-Stage Juicing System for Maximum Efficiency. Exclusive Underwriters Laboratories Inc. (UL) Household and Commercial Approval. MSRP $299 Based on the Manufacturer's Suggested Retail Price, this juicer is more expensive than average and is priced in the top 21% of juicers. Higher Power √ Designed with an above average motor that can deliver extra power for juicing harder fruits or vegetables. Also reduces wear and tear on your appliance. Food Processor √ Performs several food processing tasks such as creating homogenized foods, nut butter, or baby foods. 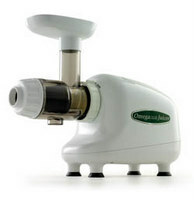 Motor Warranty 15 Years When compared to other juicers, this appliance has a longer than average limited motor warranty. The motor warranty is a good indicator of motor durability. Appliance Warranty 15 Years This juicer has a longer than average limited appliance warranty. Again, the warranty is a good indicator of overall durability. Star Rating 4.9 User reviews, ratings, and feedback indicates that this juicer is rated higher than average by 25 users and ranks in the top 5% of juicers.